9mm Luger or .40 S&W? Is 40 S&W better than 9mm? Which caliber do you need for your next semi-automatic pistol? First and foremost, which of the two rounds is the more available? Which is easier to find? There’s no question that 9mm is the more available of the two. This isn’t to say that .40 S&W isn’t widely available, because it is. But 9mm has been around for much longer than the .40. It’s also far more common worldwide, and is by far the most common and plentiful centerfire pistol round in existence. Which is the cheaper of the two between 9mm and .40 S&W? Again, 9mm is the winner here. Ammo prices in general have dropped significantly over the past year. Today, the average price for 9mm is around ten dollars for a box of fifty full metal jacket rounds. In contrast, a box of 50 FMJ .40 S&W rounds will cost a few dollars more, probably around fifteen dollars or so. There are simply more handguns chambered for 9mm Luger, than for .40 S&W. Part of this is because the 9mm has been around for several decades longer than the .40. In fact, the 9mm has existed since 1902, whereas the .40 was born in 1990. But even today, there are simply more guns being produced for the 9mm as well. Some manufacturers will make 9mm pistols, but not make a .40 S&W counterpart to it. That being said, there are still a very wide number of options for .40 S&W as well. You have a number of full-size, mid-size, compact, and sub-compact options for each size, such as the full size Glock 22 or the subcompact Glock 27. Yet again, the winner is 9mm. The 9mm is simply a smaller sized bullet. As a result, you can squeeze more 9mm rounds into a magazine than you can a .40 S&W. The Glock 17 holds 17 rounds of 9mm, and the Glock 22 holds 15 rounds of .40 S&W. The HK USP holds 15 rounds of 9mm, and the .40 S&W version holds 13 rounds. The Walther PPQ holds 15 rounds of 9mm, and the .40 S&W version holds 11 rounds. The Smith & Wesson M&P holds 17 rounds of 9mm, and 15 rounds of .40 S&W. You get the point. 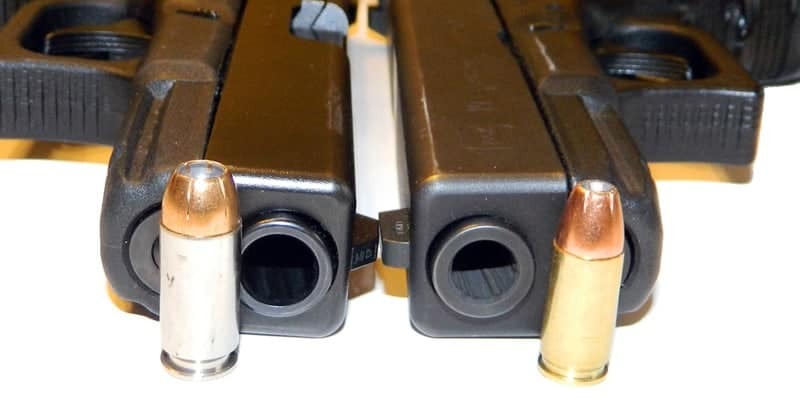 9mm pistols simply have much greater capacity than their .40 S&W counterparts, regardless of whether the firearm is a single stack or double stack. Up until now, the 9mm has been dominating the .40 in terms of availability, cost, handgun options, and magazine capacity. But what about when it comes to ballistics and performance? This is where the .40 S&W may have an advantage over the 9mm. FBI standards state, very bluntly, that a handgun round needs to be able to penetrate at least 12 inches of ballistic gel, and not over penetrate past 18 inches. Both the 9mm and .40 S&W, depending on the specific self-defense rounds that you select, can meet these standards easily. There are many of effective self-defense options as well, such as from Cor-Bon, Federal, Speer, and Hornady. That being said, the .40 S&W is still more effective than the 9mm when it comes to penetrating barriers. This means that if the round comes into contact with a hard surface barrier, it is less likely to be deflected or ricocheted in comparison to the 9mm. Not only does this mean that the .40 S&W will do a better job of penetrating through thick clothing on an attacker, it is also less likely to cause collateral damage if the round were to miss and strike something else. In short, both the 9mm and .40 S&W are highly effective for self-defense and easily meet if not exceed FBI standards, but the edge does go to the .40 S&W for better performance. Recoil is important because it helps determine how shootable a firearm is. Less recoil means that you can fire faster follow up shots. Recoil is also determined by a number of factors, including the size of caliber and the size and weight of the firearm. Almost always, the recoil of the .40 S&W is more noticeable and snappier than the 9mm Luger, so long as you are shooting two guns that are comparable. For example, the Glock 17 and Glock 22 are virtually the same handgun, only one is 9mm and the other is .40. The recoil of the Glock 22 is definitely greater and more noticeable over the Glock 17. That being said, if you were to shoot a smaller and lighter Glock 9mm, such as the Glock 26, you may notice that it has snappier recoil since the lighter weight of the gun does a poorer job of mitigating the recoil. But in general, 9mm is the easier and more pleasant gun to shoot. There are also a wide variety of 9mm loads that have less recoil as well. In conclusion, both the 9mm and the .40 S&W are highly effective calibers that have proven themselves. But overall, the 9mm is the superior caliber, especially for beginners. It’s cheaper, it’s more available, it carries more rounds, recoil is less noticeable, and it’s highly effective for self-defense (even if not as effective as .40 S&W, but it’s still splitting hairs). If you are new to guns, you’ll be better served by going with a 9mm pistol for these reasons, and you’ll likely enjoy shooting the gun more than the .40 as well. If there is a message to be found in the ignoble tale that follows it is that the sensible citizen should never try to run over a police officer with an automobile. The cop sidestepped the speeding car and fired a single .40-caliber round through the driver’s side window. The bullet struck the hapless felon in the chest and peeled open the left ventricle of his heart like a can opener. Had it happened in the operating room the guy still wouldn’t have survived. That high-performance police-issue expanding bullet performed exactly as it was intended. It passed through the glass, the dude’s shirt, his skin, and the intervening muscle without checking up before deploying like a miniature buzzsaw to thoroughly rearrange the guy’s chest cavity. It didn’t hurt long. The .40S&W arose as the indirect result of the FBI’s 1986 Miami shootout. If you aren’t familiar with the details surf on over when you’re done here. Any student of small arms is well served to read up on it. Google is your buddy. During the Miami shootout, two FBI special agents were killed and five wounded by a pair of bank robbers wielding a variety of weapons. One of the Bad Guys, in particular, took a 9mm round to the chest and went on to foment a great deal of mischief before he succumbed. With this as an impetus, S&W partnered with Winchester to produce the ideal Law Enforcement pistol round. The resulting .40S&W was, in essence, a shortened 10mm auto cartridge. This rimless straight-walled round was short enough to fit into existing 9mm pistol frames yet pushed a 165-grain bullet to more than 1,100 feet per second. In many cases converting between 9mm and .40S&W was as simple as exchanging the barrel and magazine. The resulting magazine capacity was typically reduced from 2 to 4 rounds, but this interchangeability meant easier maintenance and a convenient transition for officers already familiar with the platform. .40S&W does inevitably offer greater recoil than the 9mm but remains more pleasant than the .45ACP. There were some teething problems but in general, the .40S&W has lived up to its press releases. Why then might the FBI and 60% of American Law Enforcement agencies be switching back to the 116-year-old 9mm Parabellum when the .40S&W was specifically designed to replace it? One word…”cost”.